Hey Tracy, something else for Scooter Swag! You can get prints from Deviantart.com – it’s like Flickr crossed with Cafepress for art. Most of it is bad (put “unicorn” in the search box!) but I found Lee Daniels as well. 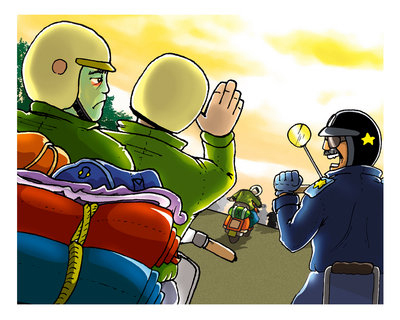 He does the cartoon for the back page of Scootering magazine. 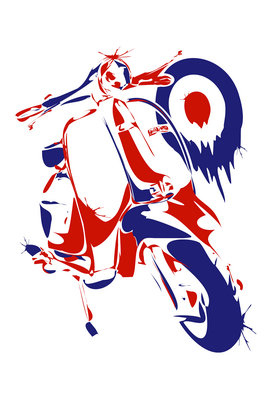 I really dig his Lambretta print. 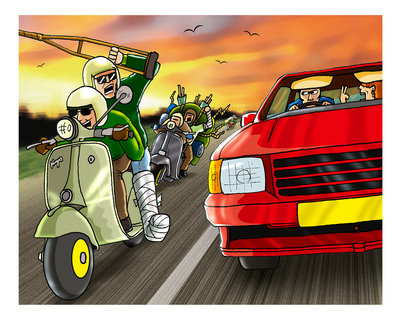 there are other people with scooter art (none as bad as what you find searching for unicorns of course) on the site that might be worthwhile to have as prints. I was thinking the small prints in a cheapo frame with a precut mat would make nice hostess gifts or good for gift exchanges at work. i love your pic and hope can use in my phorum. this phorum is about vesap and lambretta. thank you.